It has been long rumored that Anonymous, the well-known hacktivist group, was planning to target Facebook on November 5th. Fortunately, for Facebook users everywhere, Guy Fawkes day has come and passed without incident. There has been much skepticism over whether an attack on Facebook could be carried out at all. In late October, a supposed Anonymous member upped the ante by lumping Fox into the mix. Anonymous expressed their discontent with Facebook after the company made a series of privacy blunders a few years ago. Since then, Anonymous has criticized Facebook for its complex privacy controls and the "opt-out" nature of its service. The hacktivist group has also denounced Fox recently for their purportedly biased coverage of the Occupy Wall Street movement. 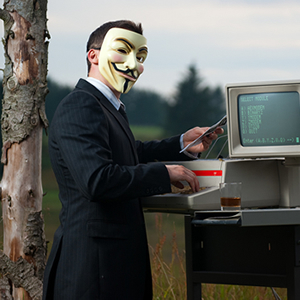 Anonymous typically uses DDoS attacks to take down websites, a method that leverages the power of millions of computers to overwhelm a specific target. Of course, Facebook sees hundreds of millions of users active on a daily basis, so it is difficult to imagine Anonymous capable of deploying an effective DDoS attack against Facebook. Afterall, one website's DDoS nightmare probably looks like Facebook's off-peak, hourly traffic. The other well-known attack vector for Anonymous is SQL-injection. In its most basic form, SQL-injection can be as simple as typing escaped code into a submission form and hitting submit. Such attacks can be far more sophisticated than this, however, the ultimate goal always being to run arbitrary code on the target server. Despite the regular publicity Anonymous receives and although it offers various channels through which it provides information, Anonymous is still, well, anonymous. This makes it difficult for people to know who really represents Anonymous. As a result, anyone can claim to be a member and post a video on YouTube, make a tweet about the next AnonOp (planned target), create a blog, upload a new document at Pastebin and so on. This seems to pose a uniquely mutual problem for both Anonymous and news media alike.